One of my colleagues, Dr. Shane Mayor, has built a very nice LIDAR system for atmospheric research. It's located at a remote site, at the end of a dirt road, and everything about the system can be controlled remotely except the main pump laser power supply. That supply has a key-switch, which has to be manually turned to activate the system. He asked me to see what I could do to make it all remote-controlled. Due to the cost of the laser, and Dr. Mayor's unwillingness to void the warranty, my suggestion that he just replace the key-switch with a computer-activated relay was met with some resistance. He absolutely did NOT want me to do anything inside that case! So instead, I built a servomotor key-turner. The basic idea is to use one of the spare digital lines on his main National Instruments control board to signal the servo controller. 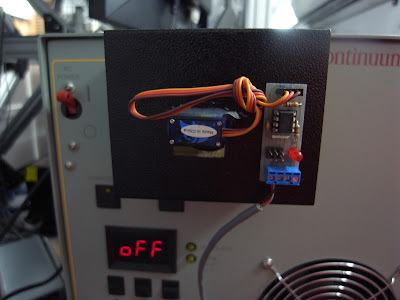 When the line goes high, the servo turns the key to the 'on' position, and when the line goes low, the servo turns the key to the 'off' position. Any simple microcontroller should be sufficient for the task: rather than commit an entire Arduino board to the job I just used an Attiny85. Still overkill, but it's so cheap that I don't stock anything cheaper in my parts bin anymore! And here's the board, which I etched using Pulsar's "Fab-in-a-box" toner-transfer paper. The software uses Ilya Brutman's Servo8Bit library, and I programmed the Attiny85 using MIT's High-Low Tech instructions. Here's my code. There's a 6-pin ISP header on the board (J1), which I use with an Arduino-as-ISP programmer. I used the top of a scrapped project box to mount the servo directly above the key and hold the servo output shaft coaxial with the key. The actuator consists of a rubber stopper with a slot cut in it, mounted on a servo control arm. The slot in the stopper fits over the key so that the servo turns the key directly. It took one re-programming cycle to make the microcontroller turn the servo the right direction (what kind of key turns left for on, anyway?) and then a very simple LabVIEW program to control the digital line to the servo, but that's it! Works great.